In what could set a precedent for forest rights struggles, six villages in Madhya Pradesh have stalled a government plan to notify their forest as wildlife sanctuary. Gram sabhas of these villages have passed resolutions against the proposed Katthiwada wildlife sanctuary in Alirajpur district. While the government is yet to come to a decision, forest officials say the project may never see the light of the day. The proposal to declare the forest a sanctuary has its genesis in the Sardar Sarovar dam project on the Narmada river. One of the conditions for its environmental clearance was to create alternative wildlife habitats to compensate for the losses of vast forest areas—more than 110,000 hectares (ha) in Gujarat, Maharashtra and Madhya Pradesh. In 2007, the state forest department published a feasibility report and said very soon the government would notify the Katthiwada forest a wildlife sanctuary (see ‘Out of obligation’). Villages in its core area—Nakti, Kewda, Kusumba, Nanibar, Motibar and, Partapura and a hamlet, Kheda—are to be relocated. Many strangers have visited the area since, say the residents, some to survey the flora and fauna of the forest and the others to inform them about the government’s decision. But no one ever consulted the residents, living in the forest for generations. Every village has a different experience to share. “About three years ago, four people in civilian clothes visited our village,” recalls Narya Bhabria of Nakti. They spread out a map and told us that six villages in the forest, including ours, will have to relocate. It was afternoon, and only three residents were present in the village. We told them we did not want to relocate and offered to call others for consultation. But they left, saying it was a Delhi decision. The residents learnt the details from other villages and from Khedut Majdoor Chetna Sangh, a nonprofit, which helped the gram sabhas draft the resolution. In 1994, the Madhya Pradesh Forest Research Institute in Jabalpur studied the impact of the Narmada dam project on the state’s 2,732 ha of forest and recommended creating two wildlife sanctuaries: a 9,200 ha sanctuary at Katthiwada and a 14,100 ha patch in Mathwad forest that spreads over Alirajpur and Jhabua districts. Later, the Wildlife Institute of India, Dehradun, conducted a feasibility study and said Mathwad is not suitable for sanctuary due to its sparse tree cover and high tribal population. It gave the go-ahead to Katthiwada. In 2007 the state government published the report making its plan public. The gram sabha of his village was the first to pass a resolution opposing the proposed sanctuary and their relocation from the traditional land. They also wrote letters to the chief minister, the divisional forest officer (DFO), district collector and the Union minister of state for environment and forests, apprising them of their decision. Next month, in August 2010, gram sabhas of the other five villages passed resolutions opposing the project. Their revolt has now spread to other villages. Twenty-four villages located on the fringes of the proposed sanctuary oppose the project. They say it would curtail their rights to graze livestock in the forest and collect minor forest produces. Residents say they are not against conservation. Katthiwada is the only thick forest in the region. 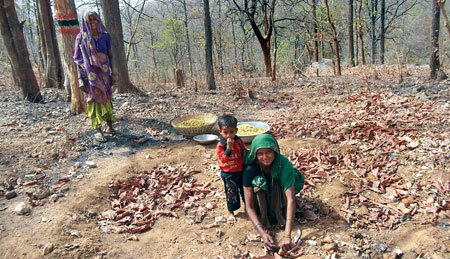 Timber gangs from Gujarat have destroyed forests in other districts and are eyeing it. “But converting it into a wildlife sanctuary is not the remedy,” says Guman Sapnya. “We have lived here since the time of the kings and protected it. Even now we patrol the forest in turns and inform the forest department when we spot timber thefts,” he adds. In Nakti, for instance, forest officials seized a truck-load of illegal timber three months ago following a tip-off from villagers. “Instead of evicting us, the government should give us the forest and help us protect and conserve it,” demands Sanya Dhanuk from Nakti. The issue is not of protecting species as the forest department sees it, says Munsingh Sapnya of Motibar. “We are part of the forest. It can’t be protected by removing us,” says the 90-year-old. Following opposition by the gram sabhas, the forest department is maintaining silence. When contacted about the status of the proposed sanctuary, the principal chief conservator of forests (PCCF), A K Dubey, refused to comment. PCCF (wildlife) H S Pabhla and conservator of forest L K Sood, who is working on the Katthiwada project, said they would abide by the government’s decision. DFO Ashok Kumar Singh said in view of the villagers’ protests, the government is considering converting the forest into a conservation reserve instead of a sanctuary. “This mean no relocation and just strictures on people living around the reserve,” he explains. Officials did not indicate if they would be consulting the affected people this time.